It is almost mindblowing how much the Betsy DeVos Department of Education under Trump is just screwing over student loan debtors. The Borrower Defense to Repayment program that is supposed to forgive student loans of defrauded student loan debtors have effectively stopped processing valid claims. The Department of Education is changing the rules all over the place and programs people enrolled in on good faith are proving to be slippery slopes of promises. Take the Public Service Loan Forgiveness (PSLF) program. Under this program created during the Bush administration, the Congress created a promise to forgive federal student loan debt for people who work in fields for the public benefit. The idea was to encourage students to get higher education in order to care for Americans. To qualify for PSLF the debtor had to work for a nonprofit providing charitable services or in fields like serving in law enforcement, public safety, nursing, legal aid, etc. 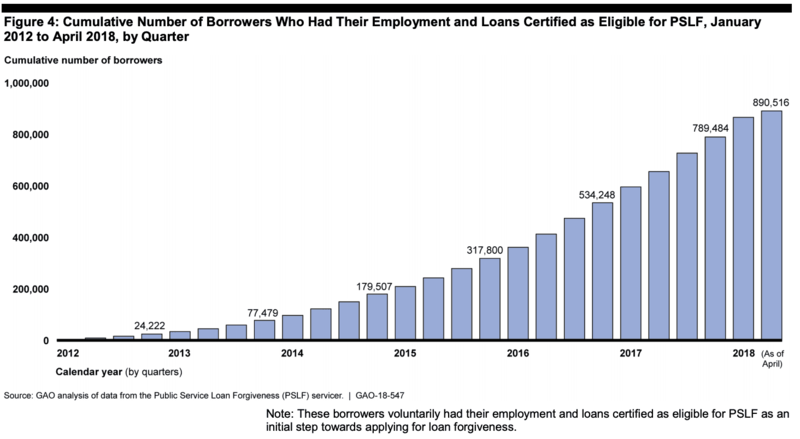 The program started in 2007, required 120 conforming payments, and the first time people would be eligible to have their loans forgiven would be October 2017. Even with knowing for a decade this program was coming, the current Trump administration has seemingly intentionally thwarted the process of forgiveness. According to a letter dated October 16, 2018, a year after forgiveness claims were to be processed, the Trump administration has received 28,000 applications for forgiveness and approved only 96. As of April 2018, 890,000 people had undertaken the non-mandatory employment certification process. And even when they received a positive response from the servicer tasked with approving these employment certification forms, the Department of Education says that does not matter. I’ve heard from people who have made a decade worth of payments, only to be told they were short on the required 120 payments and they did not count towards forgiveness. One reader even told me their payments were what was shown on their statements but was later told they were less than a dollar short each month and would not count. This lack of payment clarity is not unique. It’s another problem area the GAO investigation speaks about. The true tragedy here is students embarked in education to serve the public based on a promise by the government to forgive their student loans after meeting the terms of the program. To get the benefit of the PSLF program, debtors placed their loans into income-driven repayment plans to reduce their monthly payments. When their PSLF applications are rejected or not properly processed the debtor is left with an exploded balance due because of the way income-driven payment plans work. The result is those student loan debtors that embark on serving the public for a decade in lower-paying professions, will be left with no forgiveness, inflated balances due, and no way out of the debt. The current Department of Education may not like the program but more than a million students believed the promise. Previous Previous post: Buying an Internet-Connected Smart Toy? Read this.